Chris Connelly tells the story of when KISS went to Cadillac, Michigan. KISS On German T.V. Show "Thuringen Journal"
Here's KISS in Germany on the television program "Thuringen Journal". After KISS' performance on Germany's popular television show "Wetten, Dass..?" ("Wanna Bet?") the "bet" of the night was that 1500 KISS fans could form a giant, live KISS logo, pointing flashlights toward the sky. 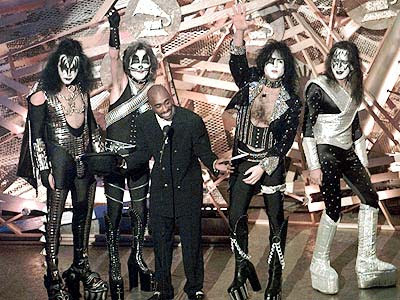 Tupac Shakur introduced the original KISS lineup (in full makeup and Love Gun-era stage outfits), to a rousing ovation at the 38th Annual Grammy Awards. It was the first time in 17 years that the original KISS line-up appeared onstage together. KISS Interviewed Backstage At "Wetten, Dass..."
Check out an interview with KISS backstage at "Wetten, dass...". Among other topics, Paul Stanley talks about his minor injury he endured while smashing his guitar at the end of "I Was Made For Lovin' You". Here's a feature on KISS's "Wetten, Dass..?" appearance in Germany's Bild am Sonntag newspaper. German fans love KISS! Here's Gene and Tommy signing autographs for fans on the street. KISS Fans Bet On "Wetten Dass..."
A German television news program reports on the German KISS fans lining up to create a live KISS logo during last night's "Wetten, Dass..?" broadcast. KISS' Souncheck On "Hallo Deutschland"
Here's a report from the German television program "Hallo Deutschland" with soundcheck and setup footage from KISS' appearance on "Wetten, Dass..?" Paul Stanley hurt himself during smashing his guitar at the "Wetten, dass..." appearance yesterday. He was bleeding and needed medical care. Listen to the audio report HERE. Click HERE to see a Photo Gallery of the stars on "Wetten, dass...". Photos with Kiss are the pics 17 to 34. Here is video of Shannon Tweed jamming with the all-female KISS tribute band "PRISS" at 'The Cat Club' in West Hollywood on Thursday, February 25th.A&E's 'Gene Simmons Family Jewels' crew was on hand filming the gig for an upcoming episode. 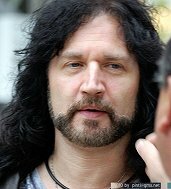 Bruce Kulick will be guest on Eddie Trunk Live on The Boneyard (XM Channel 53 / Sirius Channel 19) on Monday, March 1st. Video: KISS On German TV Show "Wetten Dass"
KISS on German TV Show "Wetten Dass..." performing "Say Yeah" and "I Was Made For Lovin' You". KISSnews.de reports "Wetten Dass..." host Thomas Gottschalk was to bring enough KISS fans with flashlights to the Messe Erfurt to stand in shape of the KISS logo. Unfortunately, not enough fans showed up to fill the KISS logo completely. However, KISS came out to the people to sing "God Gave Rock & Roll To You" with them. Photos: KISS On German TV Show "Wetten Dass..."
Here are a few screen shots of KISS performing LIVE on the German TV show "Wetten Dass..." on Saturday, February 27th, 2010. Check out some photos from KISS at the "Pavarotti" restaurant in Erfurt, Germany yesterday evening. Many thanks to KISSNews.de and First KISS Forum for thee very exclusive photos and news on KISS' visit to Germany. Kiss had lunch at 3 pm at the hotel together with their manager Doc McGhee. Yesterday the rehearsals took place without the band. Three songs were played (with someone else singing): "I was made for lovin' you", "Rock and Roll all nite" and "Modern Day Delilah". Most likely there will be a medley played tonight with these three songs. Kiss will supposedly be performing in front of the 1.500 fans who should be coming to the Messe in Erfurt. After the show Kiss will take the private jet to London. The After Show party will be at Radisson SAS in Erfurt. According to the hotel, all the stars except Sophia Loren are expected to come. Paul & Tommy have both confirmed, that there will be a completely new set list for the European tour! The name says it all: "From The Beginning To The Boom" will include songs from the whole career of the band. CADILLAC - The enduring story of how one of the world’s most outrageous rock bands helped relight the spark of a flagging Cadillac Viking football team will be told once again as ESPN airs a segment about the Vikings on SportsCenter. Former football coach Jim Neff, who made the suggestion that rock music might bring the football team out of a slump in 1974, said producers have told him a five- to eight-minute piece will air on "SportsCenter" at 10 a.m. and again at 11 p.m. Sunday. 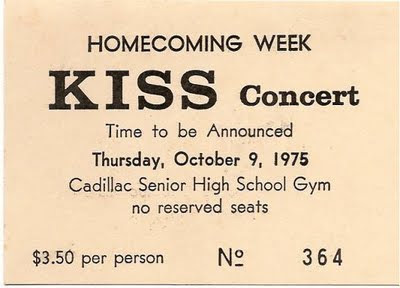 In 1974, Cadillac High School Vikings football coach Dave Brines bought assistant coach Neff’s idea to play KISS records in the locker room to get the players pumped up for the game. The Vikings had opened their season with back-to-back losses after going undefeated the previous season. 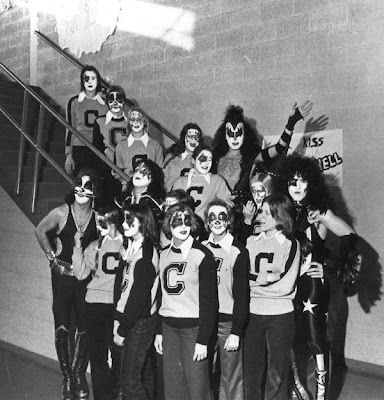 The rock music, along with some line-up changes, helped the team win the rest of their games and intrigued the members of KISS enough to lure them to Cadillac the next season, when they took part in homecoming festivities, met with students, played a concert in the high school gym and shared breakfast with elected officials. ESPN crews visited Cadillac three times last fall to interview a number of people who remember the event including Neff, Brines, and players on the 1975 team including Mayor Bill Barnett, John Coffell and Harry Hagstrom. Also interviewed were Milissa Codden-Holmes, a cheerleader in 1975, and Gene Simmons and Paul Stanley of KISS. "I’m as curious as everyone else as to how it will turn out," Neff said. Marcel Müller attended yesterday's KISS press confernce and reports that both Paul and Tommy confirmed that KISS will have a completely new set list for the European tour! "From The Beginning To The Boom" will include songs from the KISS' entire career. 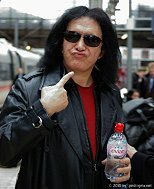 Here are more great photos of KISS in Germany at the Frankfurt train station. KISS will perform on Saturday for the "Wetten, dass..." TV show! Here's a picture of the KISS German logo sign taken from behind the stage that KISS will perform on Saturday for the "Wetten, dass..." TV show! Kiss reached # 34 of Billboards 2010 money makers, earning $ 11.833.930. Kiss spent 2009 on the road promoting its highest-charting album, the Walmart exclusive "Sonic Boom," which debuted at No. 2 on the Billboard 200 and sold 238,000 copies. The new set helped Kiss earn $10.6 million in touring revenue and $879,000 in album sales. U2 are at # 1 making over $ 108.000.000. Billboard's annual Money Makers ranking, which is the most comprehensive report card of its kind, is based on the artist's share of revenue as opposed to total dollars generated by each artist in the ranking. 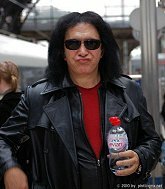 Here's Kiss waiting for the train at the train-station in Frankfurt! The band travelled from Frankfurt to Erfurt by train today after their press-conference. Check out these great pictures of the lovely Shannon Tweed jamming with the all-female KISS tribute band "PRISS" at 'The Cat Club' in West Hollywood on Thursday, February 25th. 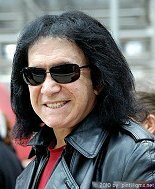 A&E's 'Gene Simmons Family Jewels' film crew was on hand filming the gig for an upcoming episode. Gene, your spousal equivalent has been wearing your make-up while you're in Germany. There's a nice article on KISS in the latest issue of the Italian ROCK STAR Magazine. The story is by Fabio Mainardi of the KISS Fan site Deuce News. Quote from issue: "This is the best KISS lineup since the reunion and this is the best live act since AliveII, period! Someone may claim n...o Ace or Peter are in the fold, but I'd tell you: leave home nostalgia and see you all on May 18th in Milan, you will be boomed away!!! Here are a few photos of the guys in the Frankfurt Hotel where the band held a press conference today. KISS fan site KISS News is reporting that Doc McGhee confirmed that KISSOLOGY IV will be released this year. The band will do additional press before appearing on the '"WETTEN, DASS..."! TV show Saturday.